As a true Midwesterner, I am torn by recognition. After years of frantically waving my arms and yelling, “Look at me! Look at me!”, I am utterly devastated that someone has. It’s unnerving and I don’t quite know what to do about it, other than mutter a meek, Thank You. 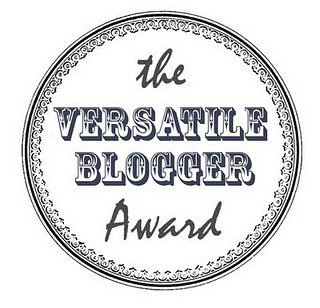 I have been nominated for The Versatile Blogger Award and to accept it, I must do one easy thing and two very hard things. The easy thing is to thank triSARAHtops for the honor. Her blog is very witty and a joy to read. I encourage you to click over to her site. The hard things that I am supposed to do are to list 7 random facts about myself and to nominate 5 other bloggers. This is exceptionally difficult for me to do because I am not good at following directions. Strike that…. I refuse to follow directions because I refuse to begin things that I know I am going to fail at – like leaping from step one and landing firmly on step two. Even if I were to follow the direction to list random things about myself, I would not be good at it because I am a fabulist and you never know what you are going to get from such a person. They might start out by telling you the gospel truth – but you know they are never going to end that way. So I am only going to list two and instead of devastating them by asking them to nominate others, I will simply encourage you to check them out. I think you need to consider every comment an award. I love your style of writing. Any success finding a print market? If not, do NOT give up. No, I have not been marketing my work. I’m just enjoying the summer and reading on the deck. More than anything, I have been working on my process, I want to get further ahead of the schedule so I can focus on quality. The Task At Hand is amazing. It’s too good to read or follow, of course. Whose ego wants THAT?! Holy smokes. No need to be reminded that I’m either too untalented, or lazy, or ill-educated, or all three to ever hit that quality. You irksome craftspeople really bug me. 😈 ), so I can overlook the skill that leads up to achieving that. No need to be reminded that I’m either too untalented, or lazy, or ill-educated, or all three to ever hit that quality. First, know thyself, after all. They’re just trying to move that along. When I was nominated, I did a little dance. The cats said with their eyes….”uh, don’t do that. It’s embarrassing.” You never want to embarrass a cat. Hear two hands clapping in digital space. My goodness, what a delight and a surprise. I long ago stopped accepting awards, just because I have my own agenda for my blog, and really haven’t much of a taste for listing random things about myself, or answering questions about which pie I like best, or how I deal with tendencies toward procrastination. But this one I accept with pleasure. I really am honored. You’re such a good writer, and there’s nothing better than having someone you admire say, “Hey. You’re not so bad yourself.” I’ve already been over to Curt’s, too, and obviously found some things to relate to over there. I have my own agenda for my blog, and really haven’t much of a taste for listing random things about myself, or answering questions about which pie I like best, or how I deal with tendencies toward procrastination. I am right there with you – but I thought it would be a great way to share what I enjoy the most on WordPress, the long form, well written blog. People still enjoy the long read – but the format of the web makes it more difficult to handle. For example, how do you mark your place if you are called away? The browser simply is not set up for this. Neither is the computer monitor, it is something you must position yourself uncomfortably to use. It is alright for work but not so good for leisure. Tablets are an improvement – but still the format is a problem. I have found that essays between 500 and 1,000 words work the best for my style… but I am beginning to worry that the short essay is locking me into a style of writing. That is why I like to read the longer blog posts, they show me what I could do. This post right here is the absolute epitome of versatile. I will definitely have to check out your recommendations. First, congratulations on your nomination! It is well deserved…you have a James Thurber-like touch that I can only hope to reproduce. Second, wha…? Apparently you were unaware of my plan to toil in anonymity with the vague hope of being discovered long after my demise, thereby allowing my posthumous royalties to rescue my widow and children from the sweatshop in which they had been forced to seek employment. So much for that! Seriously, I am honored to be recognized by someone whose writing I admire. Maybe you could lend me a clean t-shirt for the awards ceremony. I do enjoy getting recommendations from bloggers I admire. Glad you played along. Congratulations!! You are fabulist … i mean fabulous 😀 you know how much I enjoy your writing and Curt’s. Now I wiil check out triSaratops (clever name) and your other nominee. I can’t go wrong with recommendations from you. Curt writes so well, I wish he would publish more. I do, too. These last couple years have been a rough ‘go’ for him. It saddens me to hear that.